On my search for places of interest in the Cotswolds, I came across the name Sezincote and wondered immediately what could have churned out such a strange toponym when places around are called Longborough, Morton-in-Marsh or Bourton-on-the-Water. As it turns out, the French are at the origin of this exotic sounding place which comes from chêne (oak) and côte (hill). A place that looks like an Indian palace in the middle of the Cotswolds with an ancient French derived name, the pull was too strong to resist. The pull may have been strong but the place is not signposted from anywhere and I had to drive around for a good 20 min before finding its unassuming entrance in the form of a gate like any other adorned by a white washed out sign indicating “Sezincote house”. Having said this, the property is private and maybe their current owners do not want too many visitors. I can see why. If I was the fortunate owner of such a house I would keep it to myself. 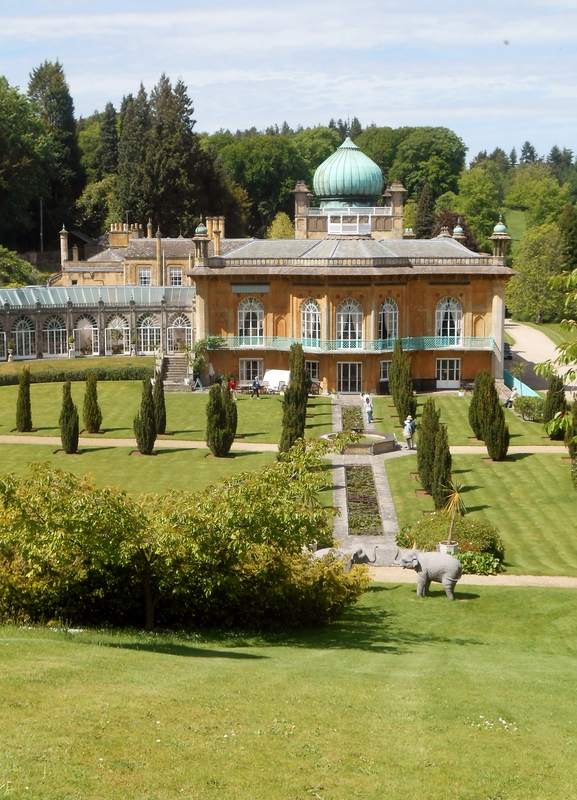 From 1809, Sezincote house fell in the care of Charles Cockerell whose family made a fortune in India and who asked for a house in an Indian style to be built. If Sezincote looks like the Brighton pavilion, it is in fact because it was the inspiration behind it. I found that what started as a folly of a house actually blends very well in the English countryside, better than it does in Brighton. The house was of no special interest as only a few features remain from that time but the guided tour lasts only 30 minutes and reveals rare pieces of furniture that are worth seeing. What sets the place apart is its gardens. Une pure merveille as we say in French. What a marvel they are! The good weather helped but the multi-level park which features a bridge, a hill, a large pond, mini canals, elephant statues, fountains, Indian sculptures, a shrine and luxuriant plants evoking a jungle is a pleasure to simply be in. Tea and cakes are served in the orangerie that overlooks the house and its hill. Strangely enough I felt at home there, as if on a visit to my aunty Jane Austen, waiting to have a stroll in her joyous gardens. What I bring back from Sezincote is the feeling of happiness and beauty I got from it. It cast a spell on me and I am glad it did. How fascinating and how personally frustrating – having just returned from a month in Oxfordshire to France I will have to wait until August now to go on a foray and see this gem for myself! The garden should still look beautiful in August. Just bear in mind the house is only opened on Thursdays, Fridays and during the Weekend. Comme toujours, un bel article accompagné de jolies photos qui donnent envie de partir séance tenante! Merci! A lovely place–visited last summer. What an extraordinary looking place! 🙂 I love it! Every destination should have one of these; I’ll be on the lookout for ours.